NASA had set out a simple challenge: Design a rocket for one of the four bays of the Vehicle Assembly Building (VAB) at the Kennedy Space Center using 3D printing where possible. The team also had to consider what materials would be used, and had just two days to complete the challenge. While there were engineers in the UQ Rocket3D team who had a background in mechanical and aerospace engineering, none had previous hands-on involvement with rocket technology. “It was just bits and pieces of things that we learned throughout our education and out of interest,” UQ tunnel engineer Sam Grieve said. Inside NASA’s Vehicle Assembly Building (VAB). Grieve said it can be tempting to think of space projects as science fiction with limitless technology, but the challenge was designing something that was achievable and practical. To do this, the team came up with several ideas and assessed each in regards to 3D printing. Eventually they culled it down into just four concepts of varying degrees of interest and practicality. 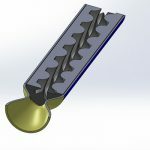 This included an aerospike designed engine, with 3D printing addressing the manufacturing difficulty with its ability to print complex geometries; thermal insulation, with internal insulation more viable for 3D printing; and structural optimisation, which can greatly reduce vibration and other effects on the system. Eventually the team found a way to combine the ideas into one design concept, as well as suggesting their solid rocket design as a separate idea as a low barrier-to-entry rocket in order to commercialise the larger aerospike project. “The idea that we ended up focusing on was a novel propulsion concept, which is called an aerospike engine,” Grieve said. However, there were some limitations when it came to 3D printing technology, such as resolution capabilities. 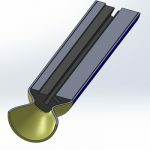 “A lot of parts that require a fine tolerance need to be machined after they’ve been printed. This is probably something that would be important for the aerodynamic geometry of an engine,” Grieve said. The team worked by splitting the group up into various sections, such as looking at the feasibility of aerospike engines and designs that have previously been tried and examining the practicality of 3D printing the rocket’s parts. “The whole time we were just coming up with ideas and we were iteratively refining them, so at every stage during the project, I guess we had some idea that we could present,” he said. A 3D printed rocket with a helical cross section. More than luck paid off for the team – they took out first place in the NASA Brisbane International Space Apps Challenge and were invited to the international competition. “I think our success was because we could refine technical engineering ideas into something that could be of interest to the private sector,” Grieve said. And although the team wasn’t successful at the international competition, Grieve said he learned some useful skills from taking part.